COUNTIES WAS RISING. 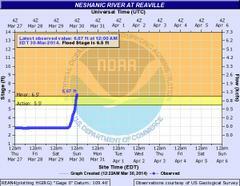 THE GAGE AT REAVILLE WAS ABOVE FLOOD STAGE. PIKE RUN AT BELLE MEAD IN SOMERSET COUNTY WAS ALSO RISING RAPIDLY. A FLOOD WARNING MEANS THAT FLOODING IS IMMINENT OR HAS BEEN REPORTED. ALL INTERESTED PARTIES SHOULD TAKE NECESSARY PRECAUTIONS. FLOODING WHEN WATER BEGINS RISING. Monitor forecasts and do not enter flooded areas.